One state agency is seeking public comment on a permit request from another regarding plans to widen Highway 70S in Cannon County. The Tennessee Department of Transportation is seeking the permit from the Tennessee Department of Environment and Conservation because the project will result in loss of wetlands, degradation to water quality and change water flow. The plan for the new alignment of 70S (SR-1) will impact the current flow of water to Rainbow Falls, which is the second largest waterfall in Cannon County. Subsequently, it will also impact water flow in Parchorn Branch. With public input, it is possible that TDOT will take extra percautions as it puts the new roadway in. It is also possible, with public input, that it consider pushing the the alignment as far as practicable away from Rainbow Falls. A specific crawfish species that only in found in Cannon County in Parchcorn Branch, just downstream from Rainbow Falls, could also be impacted by the new 70S alignment. Pursuant to Chapter 1200-4-7 of the Department's rules, the proposed activity described below has been submitted for approval under an Aquatic Resource Alteration Permit (this also includes §401 Water Quality Certifications). This notice is intended to inform interested parties of this permit application and to ask for comments and information necessary to determine possible impacts to water quality No decision has been made whether to issue or deny this application. LOCATION: The proposed alterations are located along a proposed alignment of SR-1 from Centertown in Warren County to SR-281 in Cannon County. The proposed SR-1 alignment would be on a new alignment to the northeast of the existing SR-1. PROJECT DESCRIPTION / PURPOSE: According to the applicant the current roadway configuration is inadequate to meet the increasing traffic demand, and the highway's traffic rate is higher than the statewide average. This proposed alignment is part of an overall plan to widen SR-1 from west of Woodbury to east of McMinnville. In order to construct the proposed alignment the applicant proposes to impact several streams and wetlands. Mitigation: 222 ft. of encapsulation and 25 ft. of stream loss would be compensated for by payment to the Tennessee Stream Mitigation Program (TSMP) in the amount of $49,400.00. ft of 24 in RCP, 8 ft rip-rap and 7 ft. energy dissipater at the outlet, and 16 ft. concrete end wall at the inlet. Proposed: 286 ft. of 2 @ 12 ft. x 12 ft. concrete box culvert. 46 ft. of rip-rap at outlet of the proposed culvert. Proposed: 174 ft. of 6 ft. x 4 ft. concrete box culvert. Proposed: 152 ft. of 8 ft. x 4 ft. concrete box culvert. Mitigation: 18 ft. of stream loss would be compensated for by payment to the TSMP in the amount of $3,600.00. DEGRADATION: In accordance with the Tennessee Antidegradation Statement (Rule 1200-4-3-.06), the division has determined that the proposed activities at sites #1, #2 and #5 will result in degradation to water quality. WATERSHED / WATERBODY DESCRIPTION: The project is predominantly located in the Collins River watershed (HUC 05130107). A small portion of the western end of the project is within the Stones River watershed (HUC 05130203). The Collins River watershed drains approximately 800 mi? and empties into the Caney Fork River. More information on the Collins River watershed can be found on the department's website at http://www.tennessee.gov/environment/watersheds/two/collins/. The Stones River watershed drains approximately 900 mi? and empties into the Cumberland River. More information on the Stones River watershed can be found on the department's website at http://www.tennessee.gov/environment/watersheds/one/stones/. Streams 1 and 2 are located in the Stones River watershed, and all other streams and wetlands are located in the Collins River watershed. Stream Dimension: Channel bottom width: 15 ft. – 20 ft.
Chanel top width: 20 ft. - 25 ft.
Bank height: 5 ft. – 7 ft.
All other streams have not been assessed to determine if they support classified uses. FACTORS CONSIDERED: In deciding whether to issue or deny a permit, the department will consider all comments of record and the requirements of applicable federal and state laws. In making this decision, a determination will be made regarding the lost value of the resource compared to the value of any proposed mitigation. The department shall consider practicable alternatives to the alteration. The department shall also consider loss of waters or habitat, diminishment in biological diversity, cumulative or secondary impacts to the water resource, and adverse impact to unique, high quality, or impaired waters. COMMENTING: Persons wishing to comment on the proposal are invited to submit written comments to the department. Written comments must be received within thirty days of the date that this notice is posted. Comments will become part of the record and will be considered in the final decision. The applicant's name and permit number should be referenced. Send all written comments to the department's address listed below and to the attention of the permit coordinator. PUBLIC HEARING: Interested persons may request in writing that the department hold a public hearing on this application. The request must be filed within the comment period, indicate the interest of the person requesting it, the reasons that the hearing is warranted, and the water quality issues being raised. When there is sufficient public interest in water quality issues, the department will hold a public hearing. Send all public hearing request to the department's address listed below and to the attention of the permit coordinator. APPEAL: A petition for permit appeal may be filed, pursuant to T.C.A. §69-3-105 by the permit applicant or by any aggrieved person who participated in the public comment period whose appeal is based upon any of the issues that were provided to the commissioner in writing during the public comment period or in testimony at a formal public hearing on the permit application. Any petition for permit appeal shall be filed with the board within thirty (30) days after public notice of the commissioner's decision to issue or deny the permit. Such petition must state in numbered paragraphs the basis of the appeal as required by the Administrative Procedures Act and promulgated regulations. The petition must be prepared on 8W' x 11" paper, addressed to the Water Quality Control Board and filed in duplicate at the address listed below. Any hearing would be in accordance with T.C.A. §§69-3-110 and 4-5-301 et seq. FILE REVIEW: The permit application, supporting documentation including detailed plans and maps, and related comments are available at the department's address (listed below) for review and/or copying. Click here to download a PDF file with maps of the proposed alignment area. Yes, Save the crawfish..spare the town! Any proposed route diverting traffic from flowing through Woodbury will spell the end to commerce as you now know it. Not that such commerce is so great at the present time but reduce the travel flow by 75% and see what it becomes then. Woodbury will become a virtual ghost-town, like many of the towns become once the traffic flow is diverted from them. It was such traffic that created the town. Bypassing it becomes contradictory to logic. Business thrives on traffic flow. Reduce it and you reduce business. Fact! PDF with maps is linked to at the end of the article. I hope the proposed contruction does not disturb these beautiful falls. It's nice to know that such a beautiful place resides here with in Cannon County. This county has much to offer if you just know where to look. It would be even more beneficial to the growth in commerce in Woodbury "if" there were something more here then many of these antique stores that never appear to be open on a regular basis. The majority of businesses in this town are these types of stores. One town can only support just so many of these. There are not that many retail outlets here that people cannot find elsewhere and many times the prices here are higher than other places. In these times, people are going to allow prices to dictate where they shop, not the roadways. DebbieJen, Your logic dictates that one would drive 18 miles to Murfreesboro to save a nickel. I don't think so. Think about all the restaurants in Woodbury. There are more of these than antique shops. Ask them what they will do when much of their traffic is re-routed. Ask the service stations in town what will happen when traffic is re-routed around the town. Clearly most the traffic that passes through Woodbury is "thru traffic". Without it many will suffer. 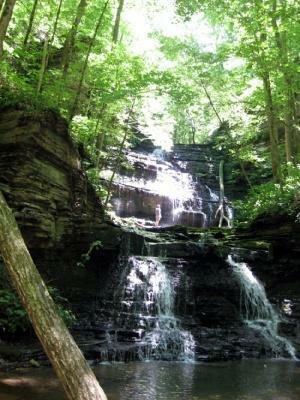 Rainbow Falls are a beautiful part of the natural habitat of the community. It is very concerning to me that the natural water flow may disturbed and I also wonder how this will affect residents in the area with their water supply since there is no city water available to residents on Parchcorn Hollow Road. Other options that are less invasive should be considered. Where are our PARQ folks on this issue? I don't see how water 'flow' will be affected at all. No divides are being changed. If silting and runoff are properly managed during construction, there should only be negligible and temporary effect on the waters over Rainbow Falls. I have never seen the falls and I am sure they are beautiful. And I would not want any damage done. As far as I know they are on private property and not exactly a commonly visited location. You should be more observant of the car tags of customers patronizing the businesses in Woodbury. Try going through the drive-throughs at McDonalds or Hardees in the mornings and you will see that easily 50% of the cars carry out of county tags. Mostly east of Cannon County and traveling to points westward. My concerns on the water flow being affected was based on the actual article and the issue that the request to the state conservation dept due to the fact that the flow of water will be impacted. Many people downstream from the falls actually still get their water from springs since there is no city water. I'm not really sure how this article went from the waterfall issue to business in Wooodbury. No one is suggesting that the road be stopped because of this just that the best procedure for protecting the environment. Proper management by the state is the issue. Also, you would be surprised at the number of people that actually do visit the falls. Fancytenn-I guess 'flow' means something different to me. In my view flow means volume of water. Putting a bridge over a stream, or putting a stream in a culvert doesn't affect the 'flow' in my view. Any construction, logging, or agricultural activity will affect surface water quality in any watershed. Water quality certainly could be impacted adversely if not done properly. It seems that the state agencies are trying to do everything properly to minimize the impact as everyone would want. Regarding water supply from springs below Rainbow Falls in the Parchcorn drainage, they hopefully would not be impacted as people 'should not' be getting their drinking water from sources dependent on surface water without proper treatment. "Blue" needs to stop hijacking this discussion. This is an article about the environmental impact of the new road; your economical concerns need to be directed elsewhere.